To commemorate the 94th birth anniversary of Pujya Sri. 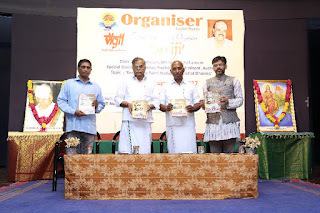 Suryanarayanana Rao Ji, the weekly edition of the Organiser was dedicated to him for all the selfless, remarkable service done by Sri Suriji towards RSS and the society as a whole. The programme started with a prayer song ‘Vande Maataram’ and the dais was decorated by eminent people Sri. 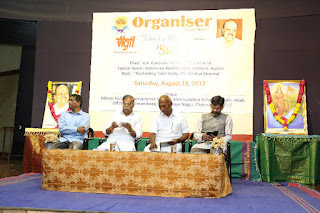 Vanniayarajan Ji President, South Zone RSS, Sri Ila ganesan Ji, MP, Sri Aravindan Neelakantan Ji , eminent author and Sri. Prafulla Ketkar, Editor Organiser. On his opening speech, Sri Vannia Rajan Ji spoke about Suriji‘s contribution towards the Sangha “A person who could shape anyone who is not aware of the Sangha work or anyone new to the Sangha, to a person who becomes very proficient and exemplary. Such was Sri Suriji’s grooming that, when needed he was strict how a father could be, at the same time he had abundance love, affection, like a mothers. He also recalled that 1980 was the year where it was turning point to Sangha in most of the individuals and society too as under tutelage and guidance of Sri Suriji the Sangha work flourished in Tamil Nadu. It was believed Suriji was personification of Swami Vivekananda where everything was pre planned and destined and happened accordance with the god’s will. Till his last breath Suriji believed in Tamil Nadu being Sanghamaya and Tamizh Culture and Hindu Culture were not different from each other. Electrifying presence of Swami Vivekananda Ji shall reverberate for another 1500 years”. In his speech Sri Ila Ganesan Ji, “Like the naayanmargal’s and alwar’s bhakthi was towards their respective gods, Suriji‘s bhakti was towards the country alone. 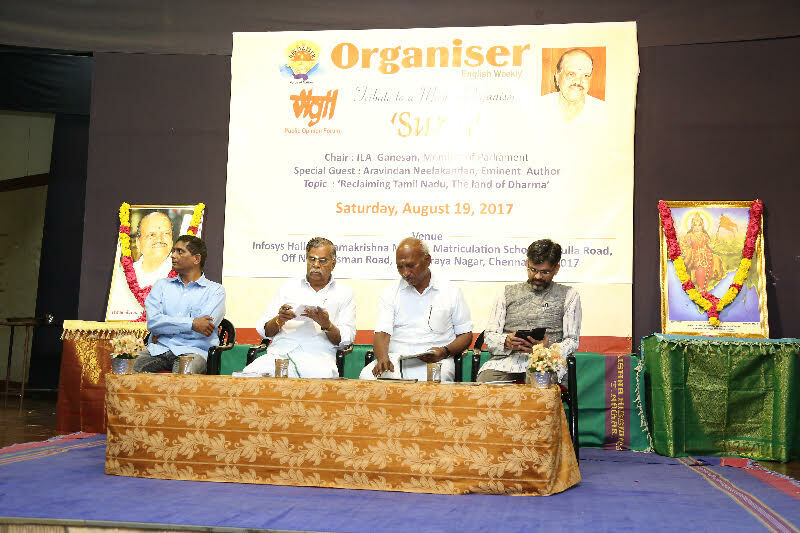 It was the organiser which not only was popular in TN, Karnataka but whole of India and has been conveying special messages and which was first restricted at the time of emergency. It’s ironical that media instead of projecting the good messages from RSS and Modi ji are trying to give messages which are not right and with added false information. He recollects a funny incident that happened at Dindigul where Suriji and ila ganesan ji were travelling by cycle rickshaw and the pracharak of that region was cycling besides him. Suriji asked the rickshaw walla to stop and got on to the pracharak’ s cycle and rode all the way to the station as he felt very restricted inside the rickshaw, such was his simplicity. During the Satyagraha movement in jail Suriji almost made a library inside the Jail much to the surprise of the authorities as he was an avid reader of Swami Vivekananda books and could recollect from any given page and book the narratives, such was his bhakthi for Swami Vivekananda ji”. The next speaker was Sri Aravindan Neelakantan ji, “It’s unfortunate that the Tamil Nadu and Bharatha culture are seen as two different things where as it’s the land of Sanathana Dharma. British education has only corroded our self-belief towards politics, education and society. India being a Hindu majority land we don’t have to have a separate colony. On the other hand we should feel superior as a Hindu Nation as it is an additional responsibility being in Hindutva is not an ideology but basis of this Nation and this land (Tamilnadu) is the Eternal land of Dharma. Hindu Rashtra is not a political goal to be achieved but to be realised by each individual as it is not the end but a means to achieve the end purpose. He recalled the goddess of the lands came from the nature of the bhoomi and its fertility quotient. He praised the untouchability idea of Dr. Ambedkar’s which would unify the whole nation at the time calamity and problem to stand unified without any discrimination among the leaders. At the time of any calamity in the country it’s the RSS people who come for help immediately” he said. Last speaker was Sri. Prafulla Ketkar, “while recalling all the memorable moments with Sri. Suriji, in 2015 when Suri ji visited Nagaur for ABPS, attended prarthana despite his ill health had only one thought in his mind realising Swami Vivekananda’s dreams into reality and carry his mission forward. He highlighted 3 points which are spiritual democracy as it’s inherent in us. Inherent unity despite the diversity differences being experienced in Bharath as Swami Vivekananda showed to us. Lastly tolerance and intolerance towards other religion and their mode of worship. Language being expression of communication, there’s an inherent unity in all the languages. Organiser has an intellectual space and Swami Vivekananda’s message of Bharath and Bharathmeeyatha is an additional responsibility of Hindus and more yagnas should be performed for Hindus participation. Vision in Action should be our motto henceforth to carry the message of Sri Suriji. The function concluded with the singing of the National Anthem.